In Schuyler County there is no bigger issue than the ongoing debate around Crestwood Midstream. The Houston-based energy company has been pursuing a development, which would allow them to store LPG beneath the surface of Seneca Lake in abandoned salt caverns. While the issue itself has been polarizing — economic development has taken a back seat. However, the other major point being discussed at this time in Schuyler County is the success and growth of Watkins Glen. 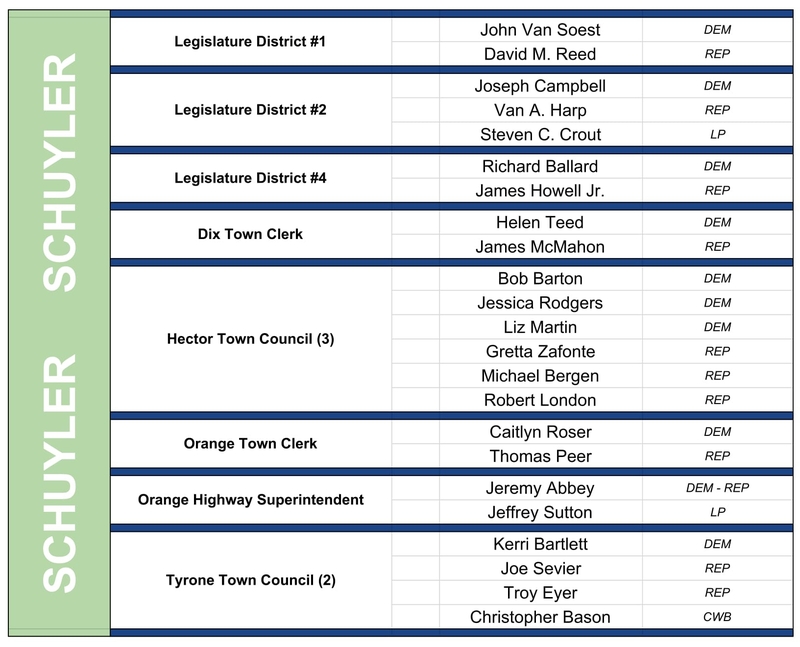 Legislative districts 1, 2, and 4 are all up for grabs this cycle, with at least two candidates seeking each seat. Most-notably, Joseph Campbell, a vocal opponent of the Crestwood Midstream development is running on the Democratic line — for District 2. Two Town Council seats in Tyrone will be up for grabs this year with the backdrop of an ongoing investigation into forged documents, which were on-file with the New York State Department of Transportation. What issues are the candidates and voters talking about?